When it comes to higher education and small and midsize business (SMB) lead harvesting, it is not uncommon to see many sub-domains working in tandem with main marketing websites to generate traffic and inquiries. Add in third party landing page(s), social media posts and email and paid campaigns to the mix and the chances for additional leads ensue. You can only hope that organizational structure dictates that sales and marketing lead activities are well documented and happen in focused, centralized silos for peak follow up, optimized communication and final conversion. But… this is not always the case because more than often leads are lost when a team member who knows set processes and has intricate local lead gen knowledge moves on or gets promoted before the lead can be converted. Leads can also end up in limbo due to bad lead management with multiple departments handling the same lead request utilizing different strategies resulting in chaos and failure. At Elliance, we help our clients troubleshoot and fix lead capture and source attribution problems from their digital properties. We start with discovery process, collect relevant information, identify all the conversion pages and signals from various digital sources. From our initial findings we produce a layout of all domains, sub-domains, third party apps, forms and lead storage databases. We share this draft with the client to furnish missing data and clarify any misconceptions. This exercise helped identify cross-channel measurement errors and data corruption due to tracking code implementation and recovery of ‘lost’ leads stored outside the main CRM. Both reasons directly affecting the $$ revenue and marketing spend ROI. In recent years, digital marketing has exploded with rapidly changing landscape and technology. It is very common to engage Facebook, Instagram, twitter, Adroll, Adwords, YouTube, display ads, emails and many more channels to drive traffic to websites. Each of these channels requires use of systems that capture and measure its own signal. Although there are solutions available to manage all these activities from a single application, cost wise, these applications are beyond the reach of most SMBs. Digital Marketers are responsible for running media spend, creating and maintaining content, measuring results, making adjustments and reporting campaign performance. At times, it is overwhelming to manage data from myriad of sources. Few marketers are lucky to tap into in-house tech support that can provide some level of automation in data gathering and reporting while others spend time manually putting data into reports and spreadsheets. No wonder marketers, with limited resources, struggle with cross-channel measurement. In the absence of automation, one solution is to utilize Google Analytics features like Goal setting and campaign signals tagging that will provide insights on campaign touch points. Focus and measure the right metrics that serve business objectives. Keep records and share with stakeholders. 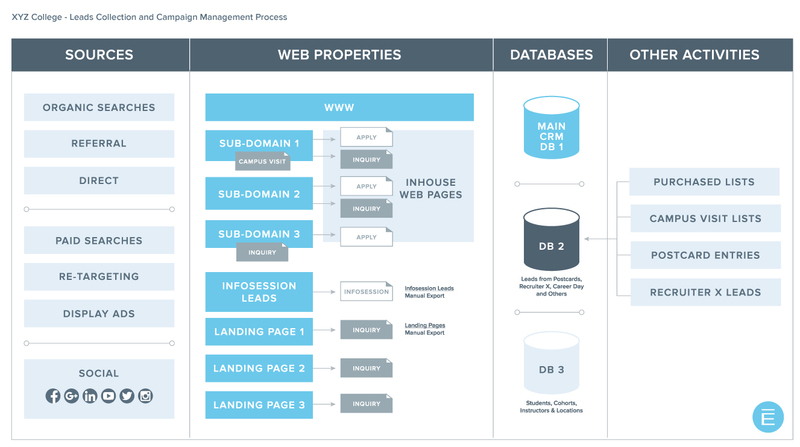 Build and maintain a schema of digital presence. Implement proper tracking on all conversion pages. Confirm lead capture into CRM. And finally, follow-up in timely manner.